Foolish. Many folks look at those who believe in God and think we are crazy. Crazy to believe God created the universe. Foolish to think that such a God would care about people in this vast universe. And prayer? It is a pipe dream on the same level as wishful thinking. It is easy to collapse under the strain of ridicule, especially when the attacks come from people we love. How do we stand brave, speaking God’s truth in love, in the face of such adversity? We have a secret delight. We know that God is pleased with us when we face adversity for His sake. In fact we God tells us to rejoice when we are mistreated for our faith. The strain of the ridicule is outweighed by the reward we will receive. So we can stand tall, smile big, and love well even while people curse us. So we can trust God to repay and make sure that justice is done. Since Jesus died for us while we were sinners and we are filled with God’s Spirit we are able to do more than not avenge ourselves. We can even show kindness. 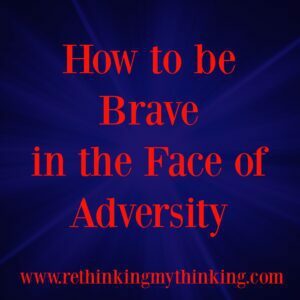 Bravery in the midst of adversity may appear weak to those expecting a physical battle. But true bravery that trusts God’s justice does not avenge, instead it shows love. We exhibit Godly bravery when we speak the truth in love and rejoice that we are counted worthy of being persecuted for Jesus’ sake. Father God I do not like adversity. I would prefer to exact my own justice rather than trusting Yours. And I certainly would prefer to not be kind to my enemy. Forgive me Lord for often choosing revenge and anger over trust and kindness. Help me to speak the truth in love, to trust You to avenge. Give the the grace to show love and kindness while I am being reviled for Your name. May I rejoice that You have a reward awaiting me in heaven. In Jesus’ Name I pray, Amen.